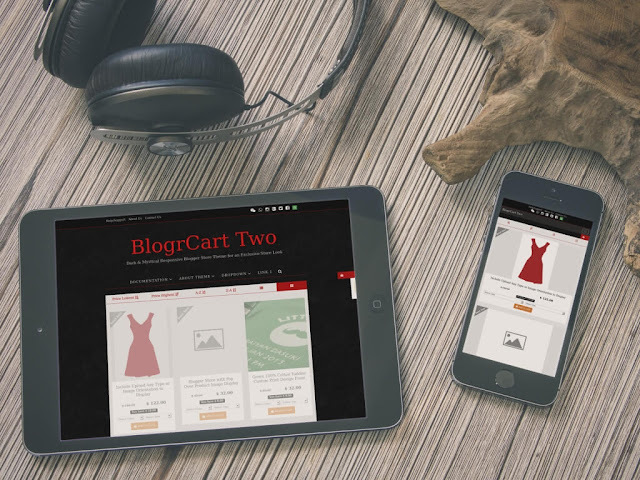 As promised, for 2016, we have launched a new responsive Blogger template with shopping cart, send email notifier & Paypal checkout - BlogrCart TWO. Another addition to our #blogrcart Blogspot template collection, create a web store or blogshop made so easy using a Blogger blog! You can find the this theme download links & this Blogger template with shopping cart live working preview for testing, right after the video embeded below. Low learning curve, no code editing required, awesome free & personalize support from theme designer, makes it one of the best, easiest & quickest way to start an online store just like e-commerce website do - without ever to worry on any recurring fees. In addition, this shopping cart pre-installed Blogspot template do not require any 3rd party services or add-ons to run its cart. Which means, blogshop owners will have full control to customize theme e-commerce functions, change theme colors & backgrounds or even change the theme looks using Blogger's built in Template Designer feature & add/remove/re-arrange built-in Blog widgets using the drag & drop functionality. We also provided a video introduction for BlogrCart TWO Blogger template & made available at our Youtube channel. If you have the chance, please subscribe to our channel http://www.youtube.com/c/irsahimihar as we also share Blogger template tutorials & tricks almost daily. Works & display in any screen sizes which include mobile devices. Custom Blogger dashboard & configuration widget helpers comes pre-installed to customize the theme according to your preferences. Each section of theme has been documented either on a dedicated page or in a video format for easy understanding/ customization. Shopping cart data, order form data sent directly to the email attached with the Blog No 3rd party or external plug-in scripts required. As simple as adding your email attached to your Paypal account. Data sent to you Paypal checkout page - secured using the https:// protocol handled by the world's preferred online payment channel. View, add, remove the selected product on an automated update shopping cart view. Over 25 preset currencies pre-installed & custom currency setup is also made available. Use shipping by cart quantity, by cart quantity or by percentage of the totals in shopping cart to auto calculate shipping at checkout. Custom shipping methods also available. Tax can be applied & auto calculated at checkout summary. Where ever possible, theme designer & developer have applied all current Search Engine Optimization SEO features & web page best practices. Product pages can now be organised by category for quick user access. Users can also sort the product display alphabetically, by price range or even change how the product is viewed. Product posts can display its status, a before price, select option price with price updater, price "Save" indicator which is commonly used on e-commerce websites. Users can view all your products offered on a single page just by scrolling. By default this Blogger template has been optimized to meet current web page best practices, which includes speed, non dependent on external plug-in resources, how content display, mobile user ability etc. This will allow your Blogger store to load faster, looks cleaner, focuses on your product/content while getting the best results when monetizing your Blogspot published pages. This theme can be viewed at http://blogrcart-two-dark.blogspot.com with all the amazing functions it comes pre-installed with. Step by step guide how to install this Blogger template. Customizing this Blogspot template looks. Frequently asked question on errors & troubleshooting. Users can "Save" the documentation page to your PC for future reference as basically all theme custom Configuration parameters & guides is also available in this Blogger template HTML. You can download this theme securely at https://sellfy.com/p/jw0u/ our Blogger template file repository or at this theme live preview pages. There is no attribution or credit/sponosred links & all mark-ups are readable to ease further customization. What's in the Download Files? If I have trouble during template install? Use our contact form to submit your inquires or contact us directly using all the contact information made available in theme download files. BTW - all support & help is free, we like to keep it that way.